woo hoo! my kitchen cabinets are organized!! i love projects like this. i love mapping out what items i want to go where and putting it altogether. am i the only one?? haha! organizing is something i love to do. whether i am organizing my craft room, my office at work, or my closet; i love organizing. i cook and bake a lot and it's important to me that i have an organized kitchen space that is constantly clean. i have always been a tidy person at my apartments when i was single or at my college dorm room but i have really discovered after owning my first home with my husband; that i am a organized-neat freak! ha. luckily, reed is a tidy and clean freak as well, so it works out great! if we have a weekend at home i always choose saturday or sunday to deep clean the house at some point. well, today was that day! i feel so much better if everything is clean, dusted, laundry done, floors mopped, etc. i hear from many friends and family members that once i have kids someday this will probably change haha! until then, i am enjoying being a neat freak. as you can see from the photos above of my before and after it is quite the difference and organized. i have always wanted an entire cabinet dedicated to baking utensils and supplies. i am a happy camper today because i now have that. and if you know me, i get excited, really excited about the little things. 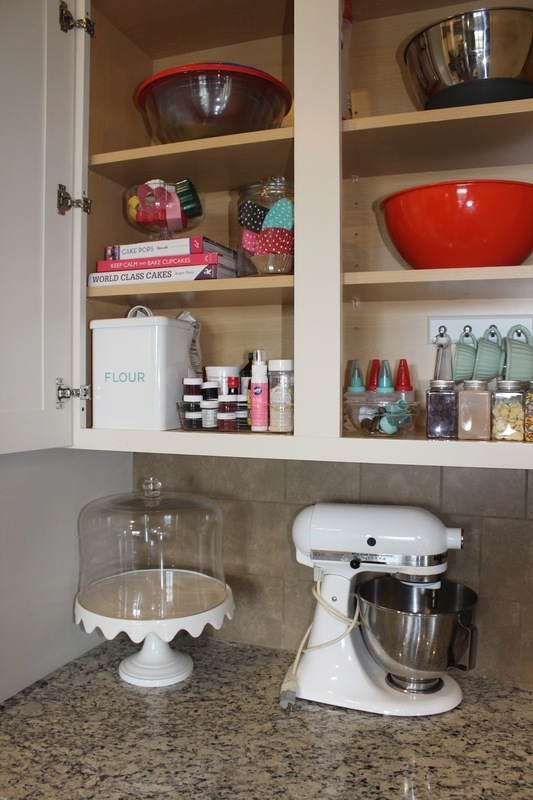 the other cabinets are organized with serving pieces and every day dishes. i have a separate side of the kitchen where our oven and refrigerator are and those cabinets have our every day glasses, coffee mugs, dishes, bowls, and silverware. they are pretty organized as well but my baking cabinet is much more fun haha! i wanted to share a little kitchen cabinet organization for your saturday. i am in the works of a lot of new changes and exciting things coming up to dots & details and i can't wait to share them with you soon. as always, thank you for stopping by and i hope you enjoy this beautiful saturday!